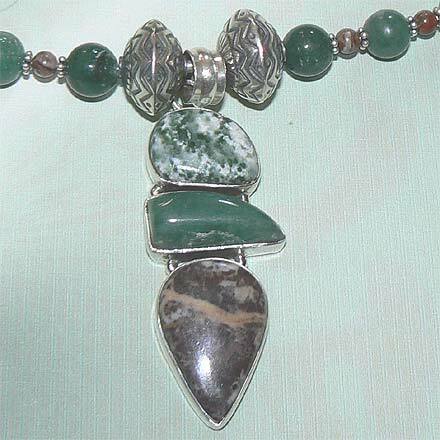 Sterling Silver Brecciated Jasper, Tree Agate and Green Aventurine Necklace. See Closeup. A dusting of snow in early Fall or Late Spring when the trees have leaves--that's what this pendant (2¾") reminds me of. On top is Tree Agate, white and green like the tops of trees. Below is Green Aventurine, the lower branches still green with leaves and unreachable to the snow. On the bottom is the trunk, or Brecciated Jasper. The necklace is 23.4" long. 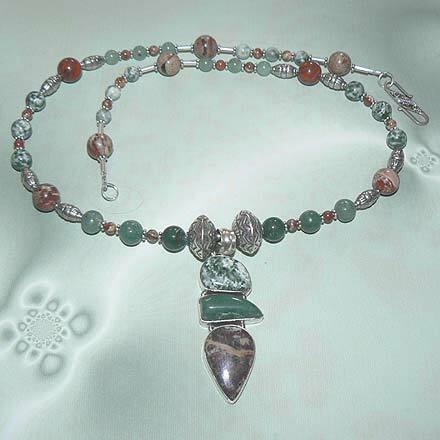 For those who are interested in Astrological significances of stones, Jasper corresponds with Virgo and Leo, Agate corresponds with Capricorn and Gemini, and Aventurine corresponds with Aries.